The Classique takes a step back in time with vintage marvels that epitomize finesse in its entirety. A chance to honor tradition and wear nostalgia. 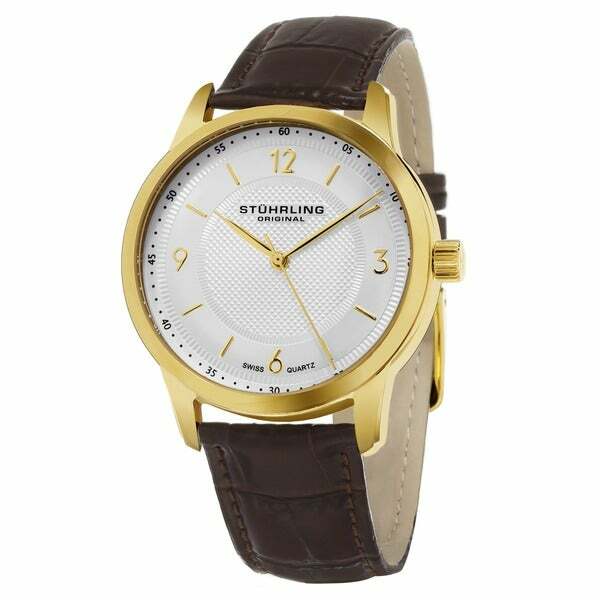 The sleek finish, refined leather band and charming display imply sophistication is your forte. Rest assured those over-the-shoulder gazes are directed at the fortuitous wrist, which beds the paragon we refer to as the Classique. Swiss quartz movement - the Swiss quartz movements used by Stuhrling are among the most reliable and accurately made anywhere in Switzerland. They are powered by a battery and its regulator (time measuring device) is an oscillating quartz crystal. An electrical current causes the crystal to vibrate consistently and at a very high frequency. This gives the movement high degree precision. Leather strap - this timepiece strap embodies the ultimate in Stuhrling leather craftsmanship with an alligator embossing. The finishing ensures a timeless effect, which is emphasized by the powerful contrast. The vivid surface is a typical feature of Stuhrling artisan leather. "What batteries do these take?" This uses a #364 battery.